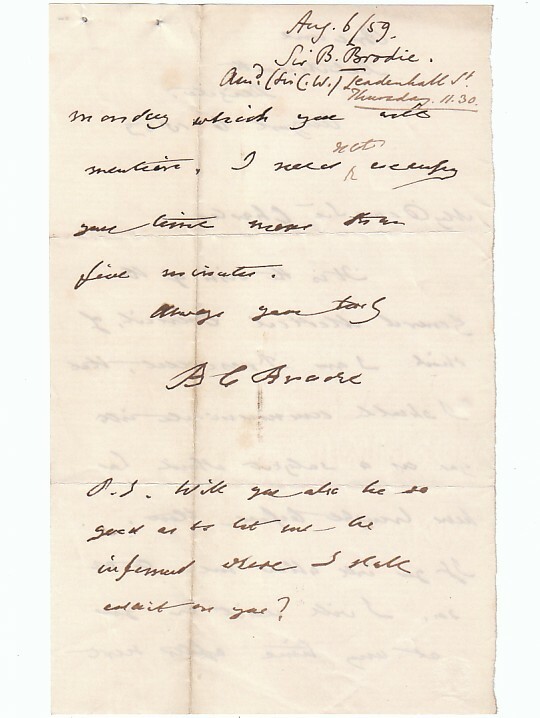 Autograph Letter Signed ‘B.C.Brodie’, to ‘My dear Sir Charles’, hoping to speak to him on behalf of the General Medical Council, of which Brodie is President. 2 pp. 7 x 4½ inches, pinhole, vertical crease, otherwise in good condition, annotated by recipient. Broome, Reigate, 6 August 1859. Sir Benjamin C.Brodie (1783-1862), surgeon, who advocated a milder treatment of diseases of the joints than amputation.